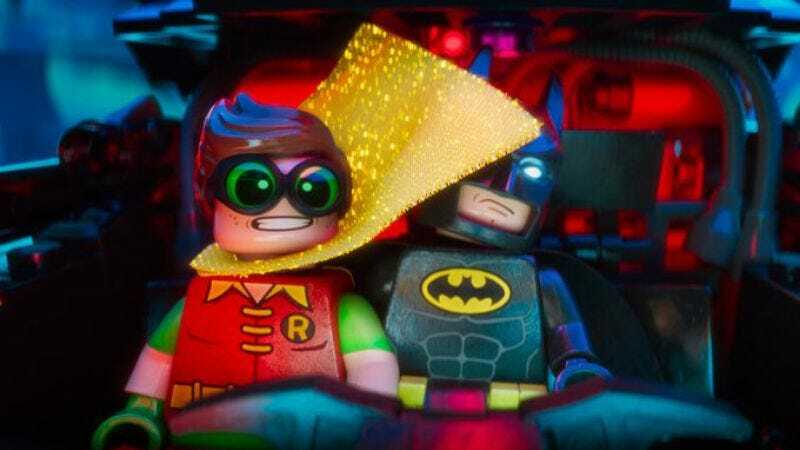 That’s an appropriate comparison, considering that the panel also showed off some new footage that featured the introduction of Michael Cera’s Lego Robin, who reportedly annoys Batman by repeatedly calling him “Dad.” The footage also featured a Lego Barbara Gordon, who Batman introduced as his “platonic bat-friend,” an especially weird line given that Killing Joke stuff. There was even a new trailer, which hasn’t been officially released online yet. On top of that, Warner Bros. released some new images from the movie earlier this week, including our first look at Cera’s Robin (up above), Zach Galifianakis’ Joker, and a more traditional take on Harley Quinn.